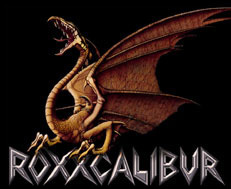 OUT NOW on Limb Music: ROXXCALIBUR "GEMS OF THE NWOBHM"
The New Wave of British Heavy Metal (NWOBHM) was the most important movement in the history of Heavy Metal. It started around 1977/1978 when Punk lost its credibility and the old heroes like Deep Purple, Black Sabbath or UFO were too much "over the top" for the fans. New bands like Iron Maiden, Def Leppard or Samson took the do-it-yourself attidute from the Punk-scene and mixed it with classic Hardrock and Heavy Metal. The result was a new scene called NWOBHM with all its independent-labels (Neat, Guardian, Heavy Metal Records and others) and many self-produced and self-released 7" singles, LPs and compilations. The biggest names were Iron Maiden, Saxon and Def Leppard, followed by bands like Angel Witch, Girlschool, Raven or Venom. But there were hundreds of other acts which are only know by NWOBHM-collectors today.